STOCKTON - Chris Scribner never had driven on the Stockton 99 Speedway oval before Saturday's NASCAR Whelen All-American Series Tri-Holiday Classic. It didn't appear that way after the Roseville driver took the checkered flag of the 100-lap Late Model main event in front of an estimated 3,000 spectators. The featured event had 19 drivers take the green flag, but seven cars suffered damage in a wild chain-reaction crash on the first lap that knocked three cars out and put the track under an extended red flag. Only 10 cars finished the race. "I didn't see (the wreck)," Scribner said. "It was all behind me. (Tony and Carol Noceti) welcomed me here to their track as I pulled into the pits. All of these racers here are good people and part of a family operation. I really like this track and am definitely going to be back." Danville's Tim Spurgeon won the Late Model dash. In the Super Stocks race, Stockton's Rich Harper parlayed a new set of tires into his second win of the season. "We didn't have the best car out here tonight," said Harper, who darted into the lead midway through the 20-lap main when Hughson's Mike Graham and Stockton's Travis Tucker got in each other's way. "They got tangled up ahead of me and when opportunity knocks, you've got to put it in there. "Once my car gets in front, it likes the fresh air and it really runs well. I had seven races on my last set of tires, so we're starting to see the results with the new tires." Graham took the checkered flag in the Super Stock dash. Stockton's Ryan Tripp battled his way to victory in the Bomber Division 50-lap main that saw six yellow flags and two reds. Tripp started in fourth and moved up to second on lap 6, which saw two yellows on the same lap. Tripp moved into the lead on lap 22 when Stockton's Guido Bindi Jr. slipped out of the lead, then held off Stockton's Darin Adler and Oakdale's Tyler Guzman, who won the trophy dash, at the checkered flag. Manteca's Joseph Reichsmuth took advantage of a restart on the eighth lap to move ahead of Stockton's Mark Jacke and held on to take the checkered flag of the 40-lap B-4 main. Manteca's Matt Anderson cruised to the B-4 trophy dash victory but bowed out late in the main with engine trouble. Jay Linstroth won the Grand American Modifieds ahead of Tracy's Scott Winters. Ripon's Mike Regelman earned the dash victory. 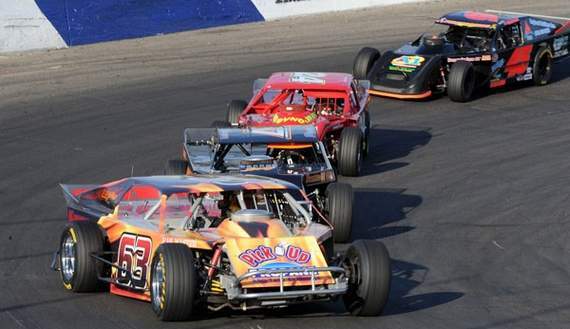 The Speedway hosts Late Models again Saturday in twin 50's, along with NCMA Sprint Cars, Vintage Hard Tops, USAC Ford Focus Midget twins and the season's first 199-lap Enduro Series race.